Majoid crabs are a group of widely distributed crustaceans, with a total of six families. This project is in three main parts. Firstly, there has not been a formal checklist of the Majoidea of Singapore except an unpublished list by Ow-Yang (1963), who listed 25 valid species of spider crabs from three majoid families. The status and taxonomy of these brachyuran crabs need to be revisited after more than five decades, especially with the substantial changes in the brachyuran systematics which have taken place in the interim. This project is also feasible in view of the recent Comprehensive Marine Biodiversity Survey (CMBS) which has obtained a large series of spider crabs from Singapore – thus now, a revised comprehensive checklist of the Majoidea can be conducted. Secondly, although the superfamily Majoidea Samouelle, 1819, is one of the largest superfamilies in the Brachyura with 892 species, there have been few recent revisions of its members. The family Epialtidae MacLeay, 1838, is the largest of the six families within Majoidea. The two selected genera, Hyastenus White, 1847, and Rochinia A. Milne-Edwards, 1875, for revision are the most species-rich genera. Although diverse in species and common in many habitats, their taxonomy is still poorly resolved. Hence, the aim for this part of the project is to revise and refine the systematics of the two selected genera. Lastly, these crabs, commonly known as decorator crabs, are known to pick debris from their surroundings to attach to their carapaces and legs, serving as a form of camouflage. Though there are reviews of the decoration behaviour of these crabs, little is known about the species found within the Indo-West Pacific region. This project will review the decorating behaviour and functional morphology of the setae and spine of Majoidea, in particular, in taxa from the Indo-West Pacific region. Abstract – Wallacea hosts extremely high levels of vertebrate endemism and is widely recognized as one of the world’s leading biodiversity hotspots. One of the primary mechanisms leading to the rich biodiversity of the region is its complex earth history. Pleistocene glaciation events in the last 2.5mya have subjected the region to sequential ~120 m sea level changes, resulting in the repeated appearance and disappearance of land bridges between some of its landmasses. This has subjected populations to alternating cycles of isolation and contact, turning Wallacea into a natural laboratory for studies on biogeography, evolution, and speciation. The aim of my PhD thesis is to investigate patterns of gene flow and divergence in the avifauna of the region in the context of Pleistocene sea level fluctuations, using a combination of genome-wide SNP analyses and bioacoustic techniques. The department is planning a memorial for Dr Ong Bee Lian on Monday, 20 April 2015 at 4 pm in LT32 and all are invited to attend. Her family members will also be present. She was a long standing member of the department from the time she was a student (B.Sc. Honours) University of Singapore. Many count Dr Ong as a close friend and colleague. She was a passionate teacher and mentor of our undergraduates. She will be missed and we intend to honor her memory with sharing by a few colleagues and students, as well as a presentation slide into a glimpse of her life in the department. Abstract: –Phenotypic plasticity is the ability of an organism to change its phenotypic features in response to environmental cues. This property is often adaptive allowing each plastic form to have a higher fitness in its respective environment. Nutrition-dependent variation in horn sizes in male dung beetles, density-dependent coloration in grasshoppers, and seasonal variation of colour patterns in butterflies are some of the well-studied examples of phenotypic plasticity. All of the examples above have implicated changes to hormone titers as the molecular mediators of plasticity, but details on how the environment alters the development of the plastic traits are still only superficially understood in each of these systems. In addition, the roles of hormone receptors and their expression in tissues at critical stages of trait development have not been elucidated in detail for any system. Finally, it is not known how these complex and hormonally regulated plastic systems originated. I propose to investigate detailed mechanisms of variation in eyespot size and brightness plasticity in one species of Nymphalid butterfly, and investigate the multi-component origin of butterfly eyespot plasticity by performing a comparative study across Nymphalid butterflies. Abstract – The banded pig, Sus scrofa vittatus, in the absence of natural predators and hunting pressures, is hypothesized to be hyper-abundant within Singapore’s forests. Their high densities pose a threat to Singapore’s already disturbed forest ecosystems and increases the risk of human-animal conflicts. Despite being a native animal, its role within Singapore’s forest ecosystems has not been fully understood yet. Therefore, there is a need for estimating the absolute abundance of Sus scrofa vittatus and quantifying its effects in Singapore’s forests. The proposed method is to analyse data, obtained from camera trapping, with a recently developed Spatial Capture-Recapture (SCR) model that overcomes most of the problems encountered by traditional capture-recapture models. Additionally, an exclusion plot study is proposed to quantify both positive and negative impacts the pigs have in Singapore’s forests. The National Butterfly will not only be an ambassador for butterfly species, but also for the lesser studied but equally important insects living within the same environment. What to find out about these butterfly nominees? 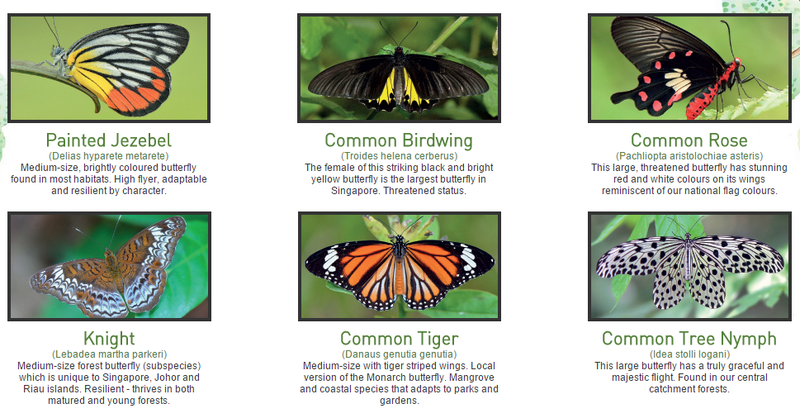 Check out Singapore’s National Butterfly webpage to find out more about these charismatic species – their colours, size, habitat, and more! The National Butterfly campaign, launched on 21 Mar 2015 (Sat) in conjunction with World Water Day, aims to raise awareness on the importance of butterflies in the environment. There are over 300 species of butterflies in Singapore, of which 20 are critically endangered. Without butterflies, reproduction of our trees and shrubs will be severely affected, and our biodiversity will be reduced. Each of these nominees have been carefully selected by experts in field based on their beauty, size, life status (if they are threatened or endangered), endemism or uniqueness to Singapore, as well as its reflection of Singapore traits or symbols (e.g., resilience, adaptability, the Singapore flag). All Singaporeans and Permanent Residents are eligible to vote for a butterfly they feel is representative of the Singapore identity. The deadline for voting is 30 Apr 2015 (Thurs), so do cast your vote now. Not to mention, voters of the winning butterfly will stand a chance to win an amazing mystery prize in a lucky draw! For more information, do check out their webpage or facebook page.